In the three days since Robin Williams' death there has been much said, much written, much shared. My initial instinct was to not say anything myself. Sometimes I prefer to write about silly things than important things. The important things are too hard to say or too hard to process or require too much analysis and thought and it's easier to just write about breast feeding in line at Chick-fil-a. But I keep thinking about Robin Williams, and about his death and every time I think about it I feel so darn sad. The tragedy has sparked much discussion about suicide and the "appropriateness" of it, for lack of a better word. A very popular blog post has been going around in which the author states that suicide is always a selfish act. He states "there is nothing positive to say about it." I did not read the article because sometimes you just know that you don't need to read certain things. But even reading a snippet of the post has made me think- how do we treat someone who ended his life "by choice." Do we revere him? Do we condemn him? Do we honor him? What about those of us who believe in God? Where do we "put" a man such as Robin Williams? In hell? In heaven? What does God say to a man who ended the life that He gave him? Is He mad? Is He forgiving? Does He understand? The truth is that the older I get, the less I understand about God. I used to think I had the Man totally figured out, but I don't at all. There are some things I have been told about God that I just don't believe anymore. I don't believe he is a God to be feared or that he is a God of anger. I don't believe in a hateful, punishing God. I do believe in a fair God, and I do believe in a merciful God; how He can be both of those things, I don't know, but I believe He is. A lot of the things I know and believe about God come from knowing my dad. My dad put on a tough act, but the truth is he was nothing but love. He disciplined his kids, he got frustrated with his kids, he about dang near lost it when we totalled his cars and put holes in the family room walls and brought home loser boyfriends. But none of that came close to comparing with the amount of love my dad showed to us. At the end of the day, He was kind. He was forgiving. He was absolutely overflowing with love for his eight kids- a love that always always outweighed the punishments, the discipline, the anger. I guess I have to believe that God is the same way. Justice and discipline, yes, but trumped by mercy and love every time. I believe He understands perfectly our situations. I believe He is kind. I believe He is merciful. I believe He has it all figured out. I believe that maybe it is all much simpler than we make it out to be down here. And I believe that when God sees Robin Williams again, there is a look of understanding, a long hug, and a terrific joke. I read somewhere many years ago that the relationship with your father determines your relationship with God, and I think that's true. I didn't have a great relationship with my dad and it took me a long time to forge a relationship with God. But like you, I believe that God is love, above all else, and then love extends to people who do terrible or tragic things to themselves or others. Those people need love and forgiveness more than anyone else. This is an exceptional post, Bon. I'm so glad that you wrote this. I have been hurting more from Robin Williams' death than I have from any other celebrity death. I don't think it is because I am the biggest fan of his comedy or his body of work, but the idea of suicide is always something that rips my heart open. I keep imagining how alone he must have been for a long, long time, and then, on Monday, the fight became too much and he succumbed to his illness. I read the post of which you speak and I am STILL so angry about it. Your words bring me some peace. I love your last line-- I think that that's how their reunion was too. Love this post so much. I'm not a very religious person myself, but if I thought God (or whatever being/entity is out there) would condemn a person to hell for one act in their life despite all the great things they've done throughout their life, I think I would lose that last hold I have on accepting religion. OBVIOUSLY my own opinion and I don't judge anyone for believing whatever they do, I just can't be on board with a God that doesn't look at the whole picture. What I gathered from that blogger's post is that he's wanting people to make sure they are not glamorizing it because those who are suffering from depression may get the wrong idea that it's acceptable to commit suicide and there's nothing good that will come from that. He even had to write a rebuttal post and it made more sense after. But back to your post, I think you wrote this rather beautifully and these are also the same thoughts I've been thinking. I don't see God as being angry and not being rational about the situation. I believe he is a forgiving God and will give Robin grace. I love everything about this! I don't think we're supposed to have God "figured out." It's not up to us to know who goes where after they die, it's up to him. And I don't think he's angry and vengeful - he loves us and is full of mercy and grace. If he wasn't - then what's the point? I was always taught suicide meant they were going to hell. But people like Robin are ill. They have a disease. A chemical imbalance. I don't see the difference between depression and diabetes or COPD. I personally believe God knows that. I usually meet celebrity deaths with a sort of passing, "Oh, that's unfortunate." But this one really hits home and it hurts. I really enjoyed your post. I am starting to realize how little I understand about God and the way He works, too. But I trust Him and believe in Him and I know that even though I don't have it figured out, He does. This is beautiful. And I agree..the older I get, the less I understand God and the Gospel as well. But, I wholeheartedly believe in both! This is so beautifully written! I agree that good is confusing but I do believe he is merciful and fair. Yes suicide is a sin but people due everyday after having committed sins. 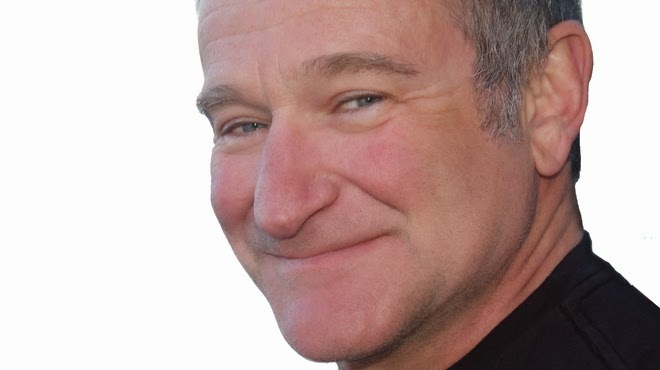 I have a friend who committed suicide and he was very much like Robin Williams, always the class clown and the funny guy. But on the night we were celebrating his life, we looked up and saw one single star in the sky. And I just know it was him looking down on us. I do believe those who commit suicide go to heaven. Wonderfully written. I really enjoy reading your blog because of posts like this one. I love love love this. And I so agree, especially on the statement about "the older I get, the less I understand God" and also the part about "discipline and justice, but also mercy and love." That encapsulates my views perfectly!!! Perfectly written and I couldn't agree more. I think that's exactly how they reunited. I love you so much, Bon. I love this. Wow - I think this is one of the nicest things I've read concerning Robin Williams' death. Very compassionate. Just Beautiful!